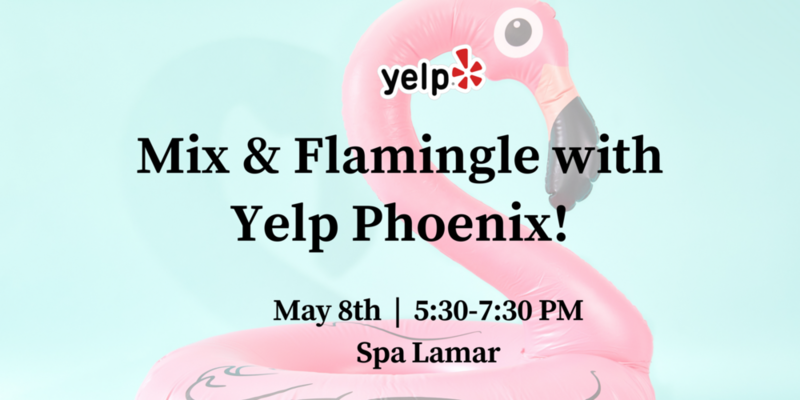 Mix and Flamingle with Yelp Phoenix! A biz bash?! What can I expect? A unique opportunity to connect with leaders of the top local businesses on Yelp and the Yelp Phoenix team. Enjoy free paraffin hand treatments, chair massages and mini oxygen facial treatments, all brought to you by the one and only Spa Lamar! Last but not least, visit our Yelp Help Desk for one-on-one support and answers to your burning Yelp-related questions! Connect with other Phoenix business professionals, sign-up on site for access to more exclusive events this year, and enter our raffle for a chance to win some sweet prizes! Register below and make sure to include a link to your business on Yelp so we can familiarize ourselves with what you do! Don’t Let Us Miss You at Leads Over Lunch! Yelp and The Phoenix Metro Chamber of Commerce are partnering up during the month of March to bring you many events, this networking lunch at Carrabba's Italian Grill being one you won't want to miss! Join Yelp and the Phoenix Metro Chamber of Commerce for Leads Over Lunch and meet others who are anxious to meet and do business with you! Phoenix Metro Chamber of Commerce is a uniquely innovative and active group that not only brings a refreshing change to networking but measurably delivers better results than most. This event is open to all PMCC members – and to guests, who are welcome to “check us out” before deciding to commit. The names of Members and Guests who purchase lunch will be placed in a drawing for a special raffle item. Yelp and The Phoenix Metro Chamber of Commerce are partnering up during the month of March to bring you many events, this networking lunch at California Pizza Kitchen Desert Ridge being one you won't want to miss! New street corn and chicken lettuce wraps for an appetizer; chicken tequila and garlic cream penne for the kinds of pasta, and Italian Chop and Caesar Salad. An assortment of cookies and brownies for dessert. Beverages are 2 different fresh brewed teas, lemonade and water. Yelp and The Phoenix Metro Chamber of Commerce are partnering up during the month of March to bring you many events, this exciting mixer at Jake's Unlimited being the first to kick-start the month! You're invited to join us at the beautiful Classic Cooking Academy for a private 4-course Italian cooking class! You've been specifically invited to this exclusive, complimentary event where we'll be making a special announcement to celebrate your success in the Yelp business community! We'd like to invite you to simply enjoy yourself at a private cooking class for local business leaders at premier cooking school, Classic Cooking Academy. This exclusive, complimentary event will include a 4-course Italian meal cooking instruction, wine & beer pairings, a delicious meal and time to network with other great local business leaders and marketers. This is a pre-paid event with limited space, so we ask that you kindly RSVP only if you fully intend to join us–we don't want anyone to miss out who could have attended! Questions? Contact Sophie L., your Yelp Phoenix Local Business Partner at slapkin@yelp.com. Attend this free Yelp workshop hosted during the 2018 Desert Pool & Spa Show! 91% of consumers read online reviews for local home service businesses and consumers rank Yelp the number one site for finding them. With 99 million monthly unique visitors via mobile and another 84 million unique visitors to the desktop site, it can be a powerful tool to help grow your business. Join us as Yelp's Local Business Partner, Sophie Lapkin, discusses the free tools Yelp offers business owners, managers and marketers to manage your online reputation and learn ways to use these tools to build relationships with potential customers and grow an engaged business. To attend, register below and include a link to your business on Yelp so we can familiarize ourselves with what you do. Be sure to bring your laptop! You've been invited to Harvest New Connections with Yelp Phoenix: A free, private event on the Skyline Terrace at the Renaissance Phoenix Downtown for local business owners, managers, and marketers! This is a unique opportunity to mix and mingle with members of the Yelp Phoenix team and other influencers in the valley while enjoying complimentary (and festive!) bites & sips, live music, sunset views of the Phoenix skyline and raffle prizes! You'll have the chance to visit our Yelp helpdesk offering one-on-one support and chat about free ways to optimize & get your Yelp Business Page holiday ready.